Why you should choose World Class Hospitals in India for Most Advanced Artificial Limbs Prosthesis Treatment? Artificial limbs, prosthetic limbs or prostheses are mechanical replacements for missing limbs -arms or legs. 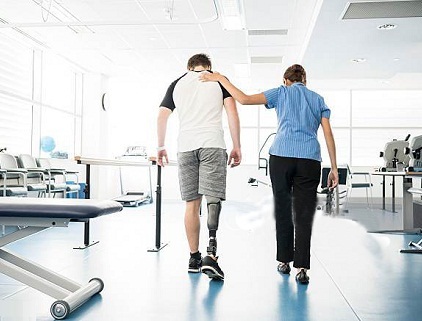 When people have the misfortune of losing their arms or legs due to injury, disease or birth defects, artificial limbs help amputees get back to their normal functioning to a certain degree. Cancer, infection and cardiovascular disease brought about by disorders like diabetes are leading illnesses that cause amputation. Serious calamities like the recent earthquake that devastated Haiti bring in their wake thousands of seriously injured people who will need artificial limbs as their wounds begin to heal. Upper Extremity Prosthetics: The i-Limb hand has the inclusion of a thumb that like a human thumb can rotate into different positions for grip configurations. All five digits are individually powered allowing the hand to imitate the true movement and lifelike accuracy of a human hand. Touch Bionics developed a thin layer of semi-transparent material that has been computer-molded to accurately wrap to every contour of the hand. This i-Limb Skin provides a grip surface while protecting the hand from dust and moisture. They have also teamed up with Living Skin to create a custom cosmesis that will anatomically blend with the rest of their body for a more lifelike covering. Myo Electric Limbs: The Utah Arm offers microprocessor technology for above elbow amputees allowing them to have simultaneous control of elbow, hand and wrist (optional) while also allowing the wearer to choose the speed of movement for a more natural response with less effort. Myoelectrically control upper limb prostheses offer the highest level of rehabilitation available today the system combines an attractive apppearance wth higher grip forace and griping speed. Small rechargeable li-Ion, NiMH-or Ni Cad batteries provide the power source for all systems. These batteries may be integrated into the prosthesis regardless of the shape of the residual limb or socket. Cosmesis : Livingskin creates custom finger, hand, toe, foot and facial prosthesis as well as cosmetic covers for arm and leg amputations. Each device is custom painted to match any unique features and the skin tone of each patient. Above elbow prosthesis are enhanced with Derma Hair that will never fade, rub off or fall out.The prosthesis is painted to match her other arm. This includes subtle color changes around her knuckles and palm. It is carved just for her. This was done by an impression taken from her other arm. It has lifelike-looking fingernails. These include lunulae (half moons) at the fingernail bases and white at the tips. Balondemu Darkwah from Uganda shares his India Medical Travel Experience.